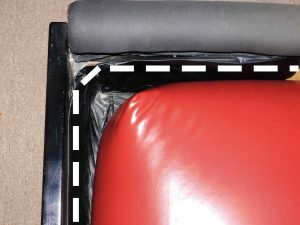 Once a waterbed is setup correctly, the only bit of maintenance that a user needs to do is remember to add conditioner every six months. 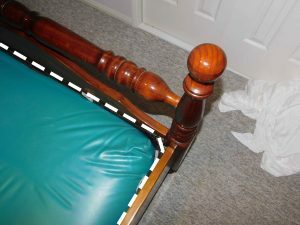 This step is often forgotten by waterbed owners but is such an important step in prolonging the life of a mattress. Over a period of 10 years, the difference between a bladder that has had conditioner added every 6 months compared to a bladder that has never had conditioner added will be stark. The bladder with conditioner added will remain supple and help prevent shrinkage. The filler valve here has also gone very hard to the point where vice grips were needed to extract it. Conditioner is so important to help prevent this from happening. 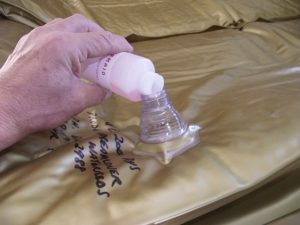 Shock Treatment Concentrate – start up treatment for newly filled mattresses. One whole bottle when mattress is filled. 6 monthly conditioner – Shock Treatment Concentrate – Use 1/3 of of a bottle every 6 months. One bottle lasts 18 months. 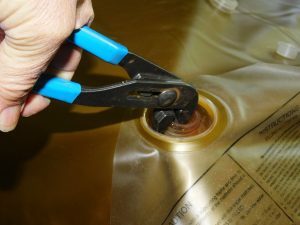 Add to mattress water every 6 months – shock treatment is more economical than buying the old 6 monthly conditioner bottles. We like to have a higher concentration of Conditioner for added surety. 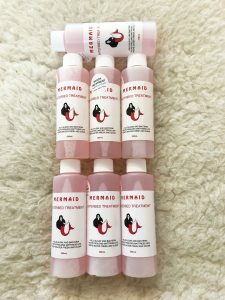 Mermaid Conditioner. The only conditioner in which we trust. Add conditioner every 6 months to help protect your mattress.